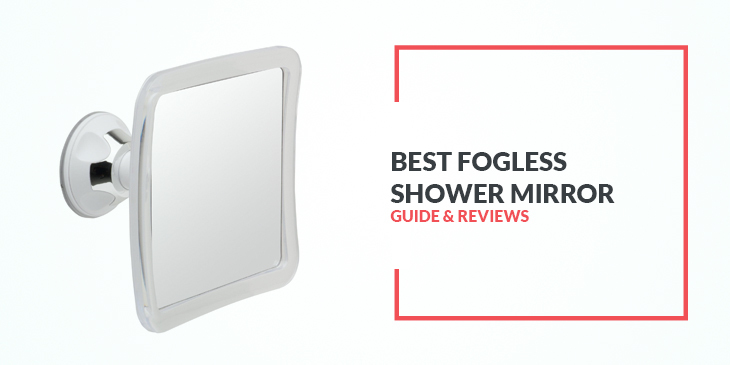 Nowadays, more and more people are looking for the best fogless shower mirror they can get. After all, fogless shower mirrors are very cheap, and they’re quite convenient. No more having to wipe down a foggy mirror constantly when you’re shaving, or for facial cleansing. You don’t have to worry that you missed a spot because your mirror is showing a distorted image. How exactly does the mirror become fogless? There are several effective ways, but each one has its drawbacks. Some just need you to run the mirror surface under the warm water or have some warm soapy water run over it. This is great when the mirror is right inside your shower stall, but inconvenient when it’s over the faucet basin outside the stall. Other mirrors require you to put some warm water inside the mirror reservoir, so the mirror keeps warm. There are even mirrors that don’t require you to do anything, since they have a special coating on the mirror surface that keeps it from fogging up. But this coating can wear away in time. The other main problem with these shower mirrors (aside from whether it actually is fogless) is keeping them stuck on the wall. Usually, you don’t want to bolt these things on the wall. So you can use suction cups if you want to take down the mirror frequently. For a firmer installation, a silicone adhesive is usually used so the mirror stays in place until you take it down. There may be some residual adhesive, but you should be able to remove easily with commercial removers or even with rubbing alcohol. The point of the mirror is that you should be able to see your whole face at the distance you usually use it. It’s best if its angle can be adjusted, so you don’t have to be in the right place all the time. This doesn’t really matter all that much, even if some models cost twice as much as another. The truth of the matter is that there are lots of good fogless mirrors that are extremely cheap. On our list of recommended mirrors, the most affordable has an $8.33 price tag, and the most expensive doesn’t even reach $30. It’s not exactly as expensive as other bathroom furnishings! Some mirrors offer storage space for your shaving utensils, which is quite handy. Others also offer extra illumination, so that you don’t miss a single hair on your face. JiBen Fogless Shower Mirror measures 5.57 inches in diameter, and you use a suction cup to stick it to the wall. You only need a surface area of 3 square inches. It comes with a swivel arm so that you can rotate it any which way, and it also comes with a built-in razor hook. Because it’s small, very light, and uses a suction cup, it’s very portable. All you need to do is to splash or wipe the mirror with warm soapy water. You only have to do this once, and it’ll remain fog-free for the rest of your shower. You can clean the mirror with just some soft fabric and warm water. Don’t use any chemical or solvent, as that will just damage the coating. Deluxe Shave Well Fog-free Shower Mirror measures 6.83 inches tall and 5.75 inches wide, and it’s just ⅛ of an inch thick. The mirror itself has a small hole at the end, and you use this to hang it on an adhesive hook that’s part of the purchase. Just hold the mirror under the shower stream for just a few seconds, and it will remain fog free. The science is simple: no fog because the shower and the mirror has the same temperature. Cleaning this is simple too. Just wet it and then use a pea-sized amount of toothpaste. That should do the trick. The mirror isn’t glass; it’s plastic. This can last for about two years. For its price, that’s actually a very long time. Fogless Shower Mirror with Squeegee comes with a bracket that you stick to the wall with removable silicone adhesive and double-sided tape. It’s designed not to damage or discolor your bathroom tiles. It offers a landscape rectangular mirror that measures 7 inches wide and 5 inches tall. The mirror is made from shatterproof acrylic, while the bracket is adjustable. To use it, just take the mirror off the bracket and then fill the back with hot water from the shower. That should take no more than 7 seconds. Then put it back and you can use it until the water in the reservoir goes cold. Since it uses this temperature balancing principle instead of a special coating, it’s designed to be fogless for life. There’s a built-in squeegee which you can use to wipe the excess moisture after filling the reservoir with hot water. And the base of the mirror can also function as a shelf where you can put your razor or your tweezers. They’ve also redesigned the pivot so that the bracket stays at the angle you prefer. If you’ve bought an older version and you have this problem, just email your info to ToiletTree Products, and you’ll get a replacement part for free. Mirrorvana Bathroom Shaving Mirror is quite a popular fogless mirror. It comes with a fog-resistant coating, which can wear off after a while. When that happens, you don’t need to buy a new one. You just need to spray on a new coating (and this spray is also sold by Mirrorvana). The square mirror measures 5.3 inches on each side. The mirror itself doesn’t break when you drop it, and it really offers a clear image. The swivel works well and stays in place. It has a suction cup at the back, so it’s very suitable for hotel rooms and guest bathrooms. The suction cup is quite heavy duty, and you need some force to remove it. This means that inadvertently bumping into it won’t dislodge it from the wall. No Fog Shower Mirror with Rotating is one of the expensive mirrors on this list, and you can see that it looks elegant.It has a round shape that measures 5.75 inches in diameter, while at the back the suction cup requires only a flat surface that measures 3 by 3 inches. With this, you only need to splash the mirror surface with hot soapy water. The swivel arm allows for 360-degree adjustment. You only need to clean it with toothpaste every couple of days. Some people may find that it doesn’t stick to their textured wall. If that happens, the manufacturer offers a 100% guaranteed money back, even outside the seller website’s 30-day return window. Since it uses a suction cup, it’s more portable. However, it uses a twisting motion to lock in place, and you need to use the same twisting motion to take it off the wall. There’s even a bonus razor holder that you can attach at any other part of your bathroom wall. You can even attach it to the mirror if you want. This Fogless Shower Mirror with Squeegee is the travel version of the ToiletTree fogless mirror, and it only costs half as much as the original. That’s because it doesn’t have the adjustable pivot and the wall bracket. There’s also no built-in storage for tweezers and razors. Instead, you get 2 powerful suction cups at the back, so you can just stick it on the wall, and then take it off when you’re done. It’s handy when you’re on vacation, on business trips, or if you’re a college student who tends to sleep wherever. It’s smaller at 4.5 inches by 5 inches, with a 6.5-inch diagonal. But it has a storage and travel drawstring pouch that comes free with the purchase. Using this shower mirrors requires the same tactic of just filling up the back reservoir with hot water before you use it. This means that this mirror will always be fogless when you use it, without the need for new coatings. And it still comes with the self-storing squeegee. Miusco Fogless Shower Mirror with Built-in Razor Holder is another elegant-looking mirror with a round surface that measures 5.75 inches wide. It uses a powerful suction mount at the back, and to put it on firmly you just have to twist it to lock it in place. Removing it from the wall will require the same motion, so it means that bumping into it won’t get it to drop. But what if you drop it while you’re trying to stick it to the wall? Don’t worry, as it’s pretty much shatterproof. Unless you really want to break it, it won’t shatter. The mirror surface has been specially treated to remain fogless for a long period of time. You won’t need to constantly spray it with the special coating or fill any reservoir with hot water. The arm is very flexible and the mirror can swivel 360 degrees. There’s also a special built-in razor holder that’s actually designed to accelerate the drying speed so that it minimizes the chances of bacterial growth and rusting. It also comes with Miusco’s 100% satisfaction guarantee with no questions asked. You can get a replacement if something’s wrong with it, or a full refund. Also Read:Best Shower Valve – Selections From A Pro! InterDesign Power Lock Suction is the circular version of the InterDesign fogless mirror, and it’s the cheapest of all the models listed here. But it looks great even if it is made entirely of plastic, and it doesn’t look cheap at all. The plastic is very clear and quite durable. It’s about 6 inches wide, so that should be enough for you to see your whole face. It has a suction cup at the back, and you can lock it in place as long as the wall us smooth and nonporous. You can attach it to tile, fiberglass, glass, and even some (but not all) metals. This can be quite portable, as you can just put it in your bag when you go anywhere overnight. It won’t leave any nasty residue. As a bonus, at the bottom of the mirror is a built-in razor hook. You just hook the top of the razor on it, and it stays in place. This rectangular mirror ha a reflective surface that measures 4 inches wide and 6 inches tall, while it’s only ⅛ of an inch thick. The Shave Well Shower Shave Mirror comes with an adhesive hook, and its base measures just 1 by 1.5 inches. The adhesive hook is quite versatile, as it can stick even to porous tile as long as you follow the instructions. The mirror has a hole at the top part, so you just hook it on. To get it to work, you only need to remove the mirror from the hook and put it under the shower stream. For best results, get both the front and back wet. After a few seconds, both the mirror and the shower water will have the same temperature, and you won’t get fog on the mirror. The mirror is made from clear acrylic, so don’t worry if you drop it. It just won’t break or even scratch. To clean it, just use some water and a small drop of toothpaste. That will keep the spots away and make it look like new again. So hopefully now you realize that there’s no good reason at all for you to endure a foggy mirror when you’re shaving. Now you can shave while you’re taking a shower, as long as the light in your shower stall is ample. With the best fogless shower mirror, you can make sure you look great, and you can get this unbreakable mirror at a very low price!